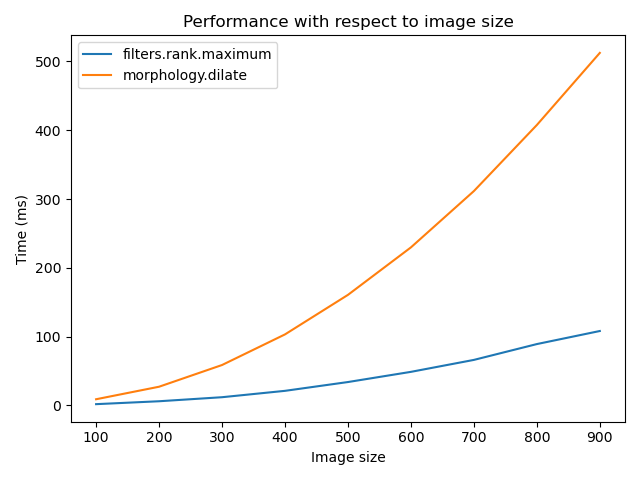 Rank filters are non-linear filters using the local gray-level ordering to compute the filtered value . 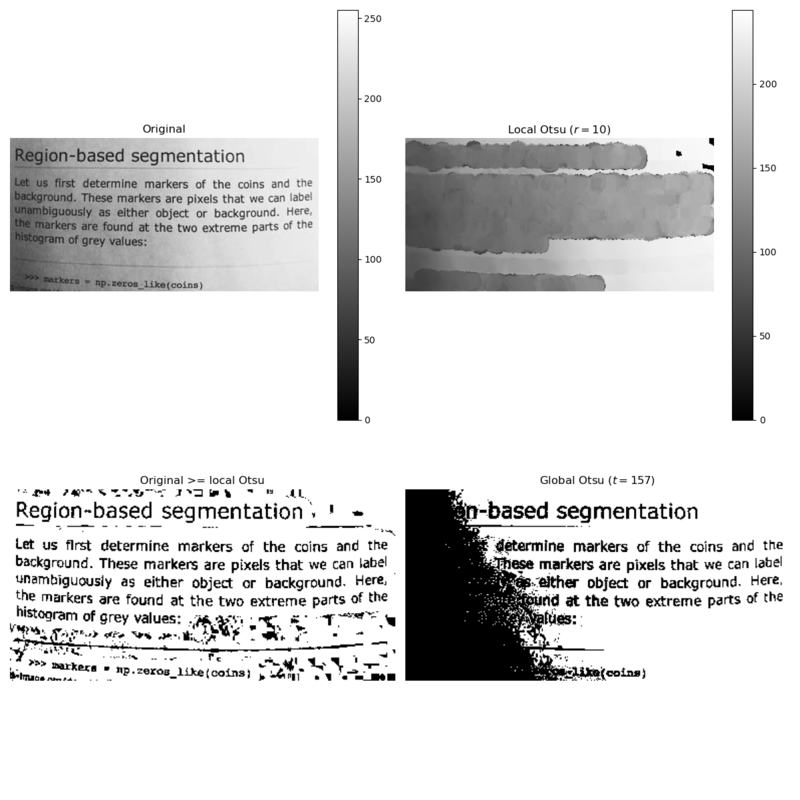 This ensemble of filters share a common base: the local gray-level histogram is computed on the neighborhood of a pixel (defined by a 2-D structuring element). If the filtered value is taken as the middle value of the histogram, we get the classical median filter. 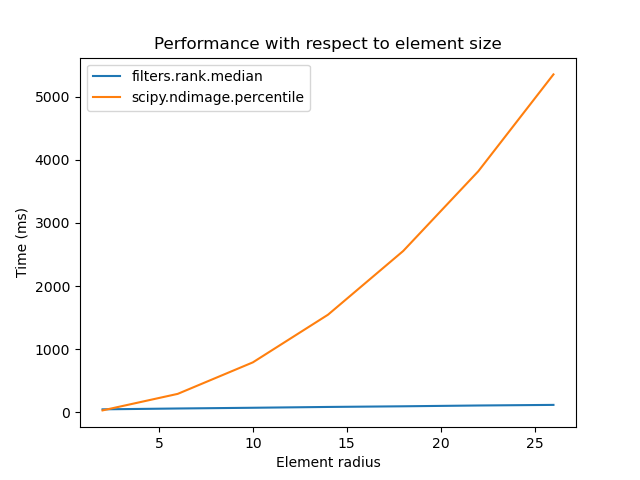 Some well known filters are specific cases of rank filters  e.g. morphological dilation, morphological erosion, median filters. In this example, we will see how to filter a gray-level image using some of the linear and non-linear filters available in skimage. We use the camera image from skimage.data for all comparisons. Some noise is added to the image, 1% of pixels are randomly set to 255, 1% are randomly set to 0. 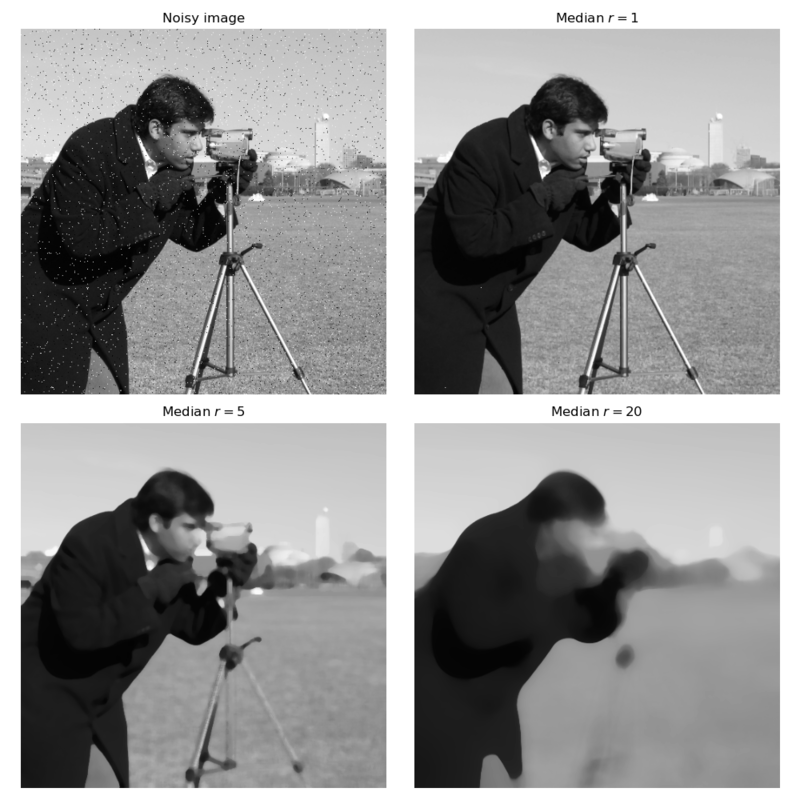 The median filter is applied to remove the noise. 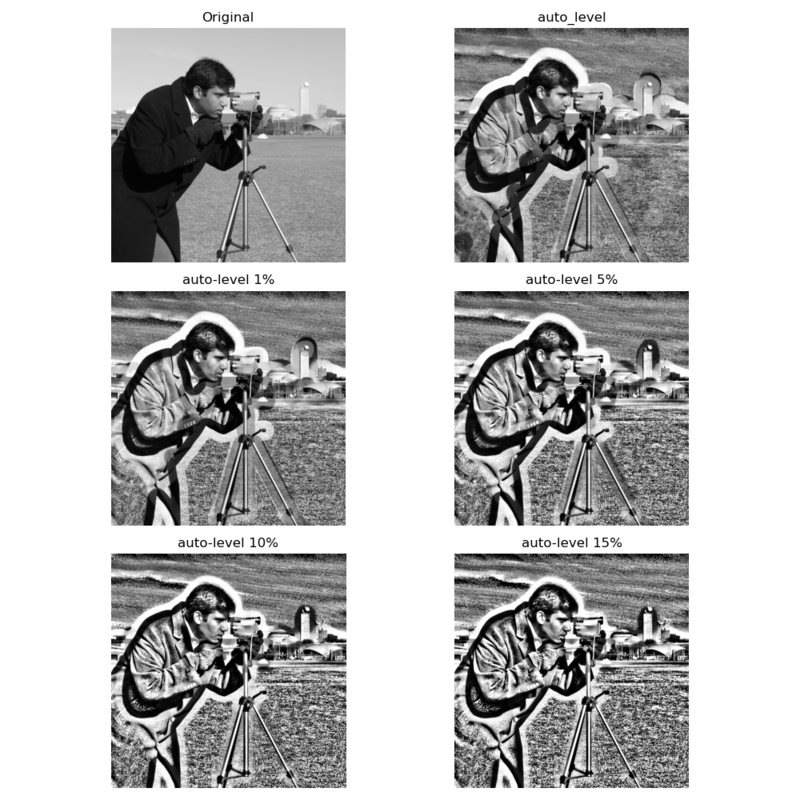 The added noise is efficiently removed, as the image defaults are small (1 pixel wide), a small filter radius is sufficient. As the radius is increasing, objects with bigger sizes are filtered as well, such as the camera tripod. The median filter is often used for noise removal because borders are preserved and e.g. salt and pepper noise typically does not distort the gray-level. The example hereunder shows how a local mean filter smooths the camera man image. One may be interested in smoothing an image while preserving important borders (median filters already achieved this), here we use the bilateral filter that restricts the local neighborhood to pixel having a gray-level similar to the central one. 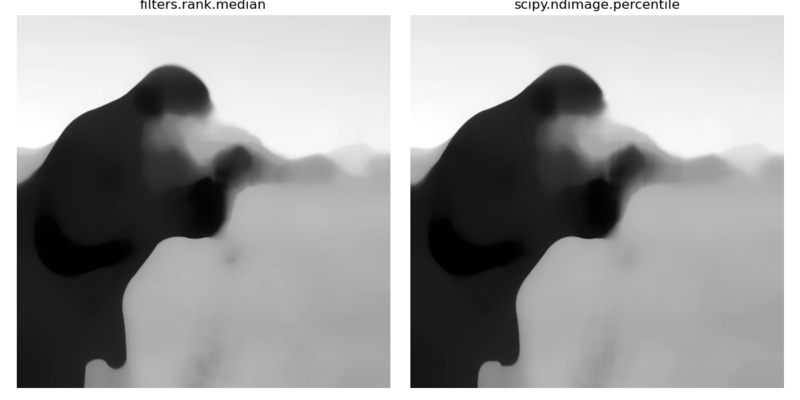 A different implementation is available for color images in skimage.filters.denoise_bilateral(). One can see that the large continuous part of the image (e.g. sky) is smoothed whereas other details are preserved. 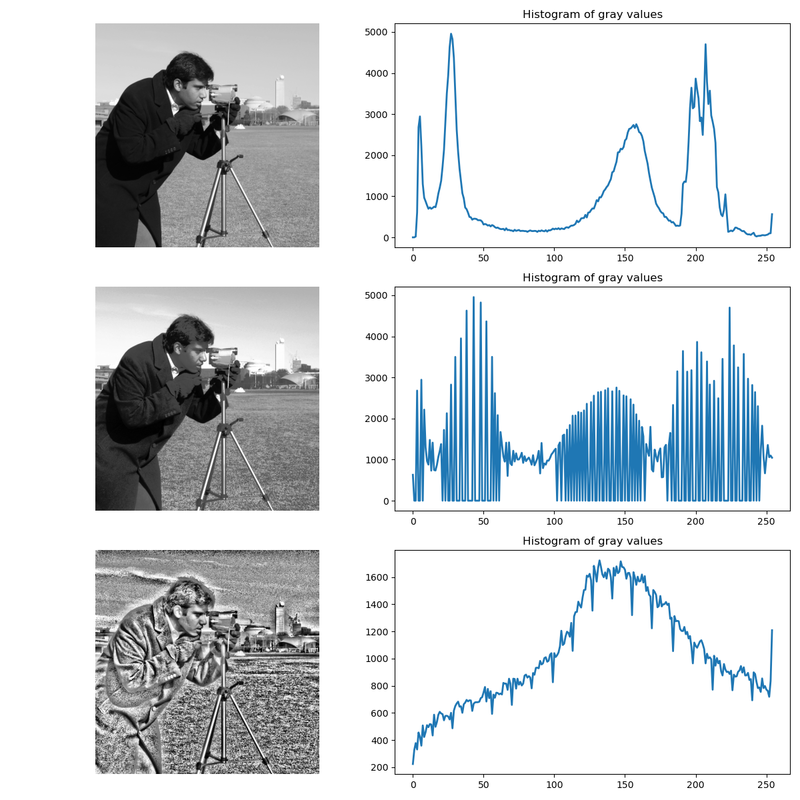 We compare here how the global histogram equalization is applied locally. The equalized image  has a roughly linear cumulative distribution function for each pixel neighborhood. The local version  of the histogram equalization emphasizes every local gray-level variations. 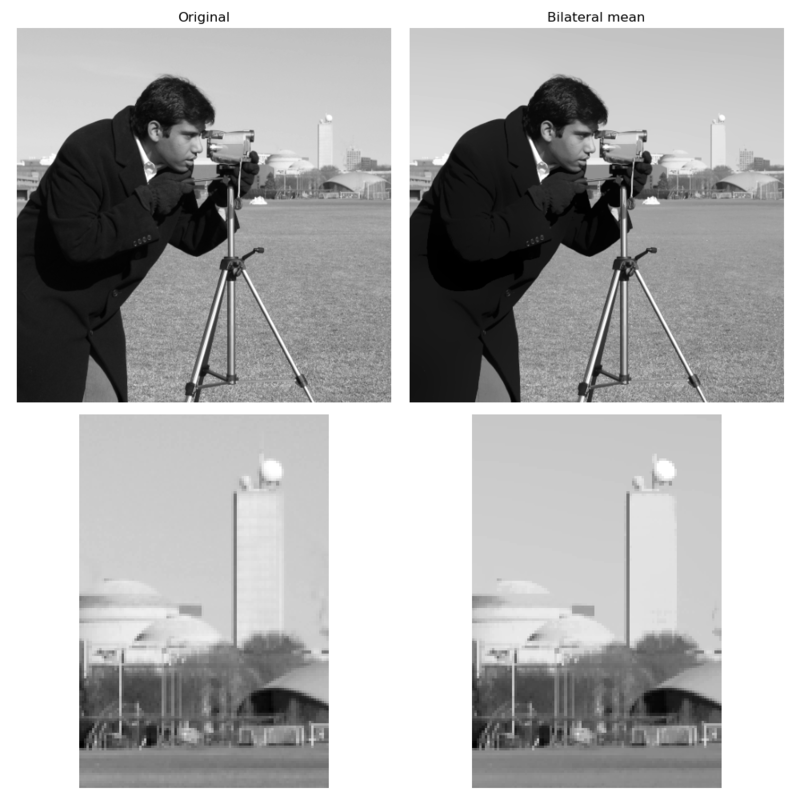 Another way to maximize the number of gray-levels used for an image is to apply a local auto-leveling, i.e. the gray-value of a pixel is proportionally remapped between local minimum and local maximum. The following example shows how local auto-level enhances the camara man picture. This filter is very sensitive to local outliers, see the little white spot in the left part of the sky. This is due to a local maximum which is very high comparing to the rest of the neighborhood. One can moderate this using the percentile version of the auto-level filter which uses given percentiles (one inferior, one superior) in place of local minimum and maximum. The example below illustrates how the percentile parameters influence the local auto-level result. The morphological contrast enhancement filter replaces the central pixel by the local maximum if the original pixel value is closest to local maximum, otherwise by the minimum local. 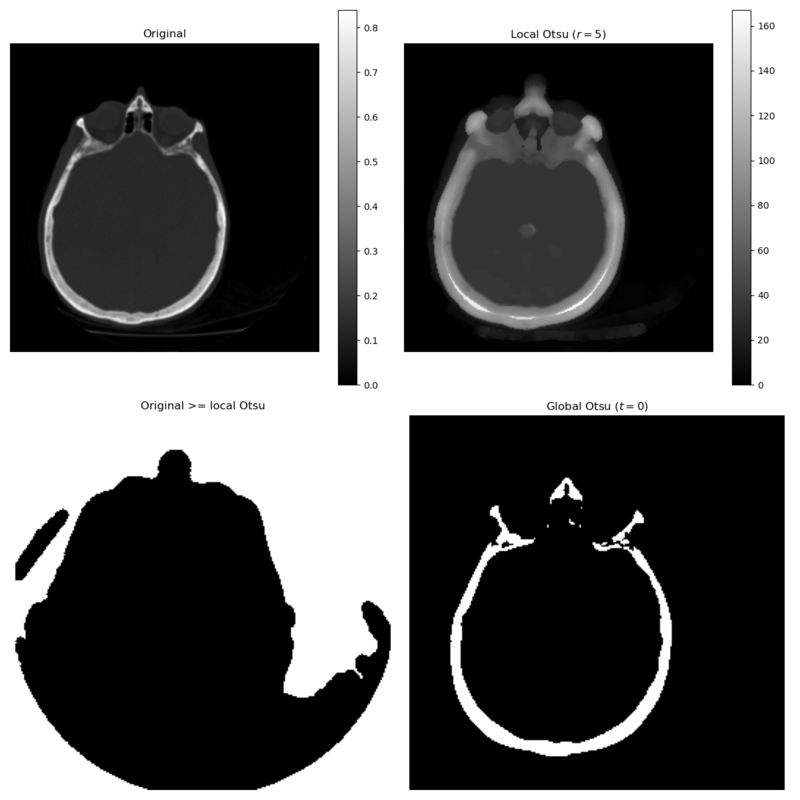 The percentile version of the local morphological contrast enhancement uses percentile p0 and p1 instead of the local minimum and maximum. 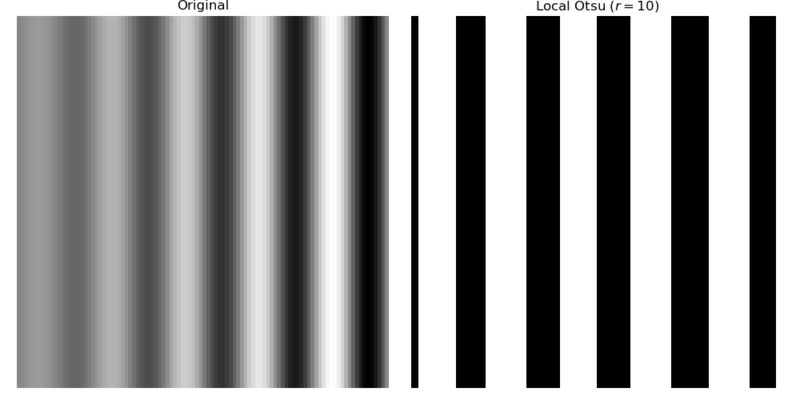 The Otsu threshold  method can be applied locally using the local gray- level distribution. In the example below, for each pixel, an “optimal” threshold is determined by maximizing the variance between two classes of pixels of the local neighborhood defined by a structuring element. 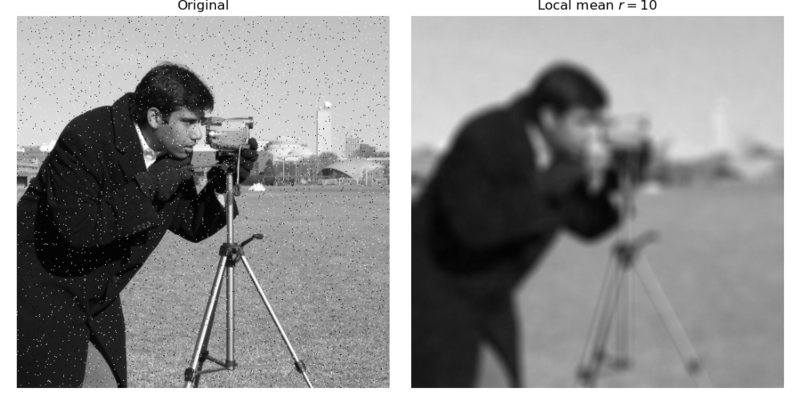 The example compares the local threshold with the global threshold skimage.filters.threshold_otsu(). Local is much slower than global thresholding. A function for global Otsu thresholding can be found in : skimage.filters.threshold_otsu(). 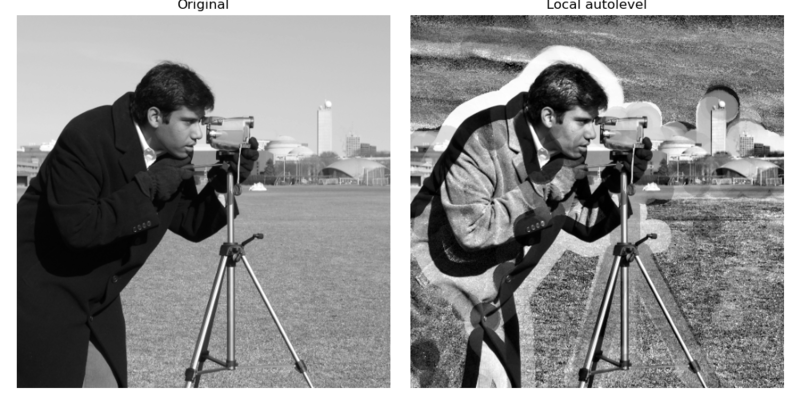 The following example shows how local Otsu thresholding handles a global level shift applied to a synthetic image. Local maximum and local minimum are the base operators for gray-level morphology. 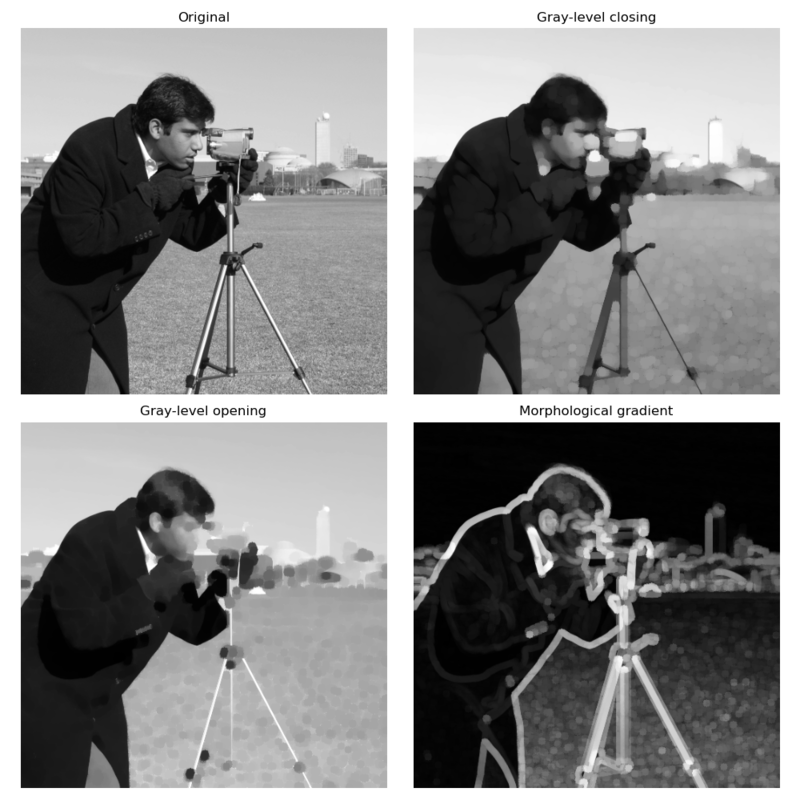 Here is an example of the classical morphological gray-level filters: opening, closing and morphological gradient. 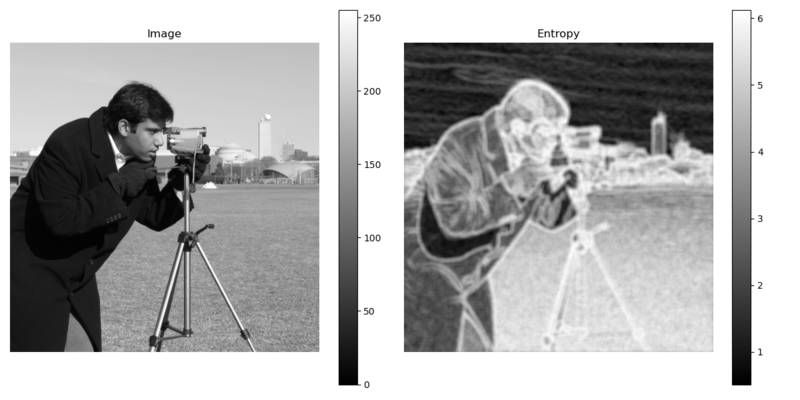 Local histograms can be exploited to compute local entropy, which is related to the local image complexity. Entropy is computed using base 2 logarithm i.e. 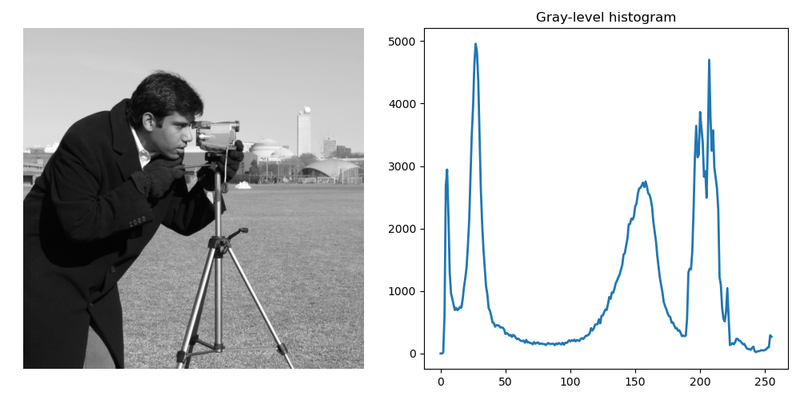 the filter returns the minimum number of bits needed to encode local gray-level distribution. skimage.rank.entropy() returns the local entropy on a given structuring element. The following example shows applies this filter on 8- and 16-bit images. to better use the available image bit, the function returns 10x entropy for 8-bit images and 1000x entropy for 16-bit images. The central part of the skimage.rank filters is build on a sliding window that updates the local gray-level histogram. This approach limits the algorithm complexity to O(n) where n is the number of image pixels. The complexity is also limited with respect to the structuring element size. 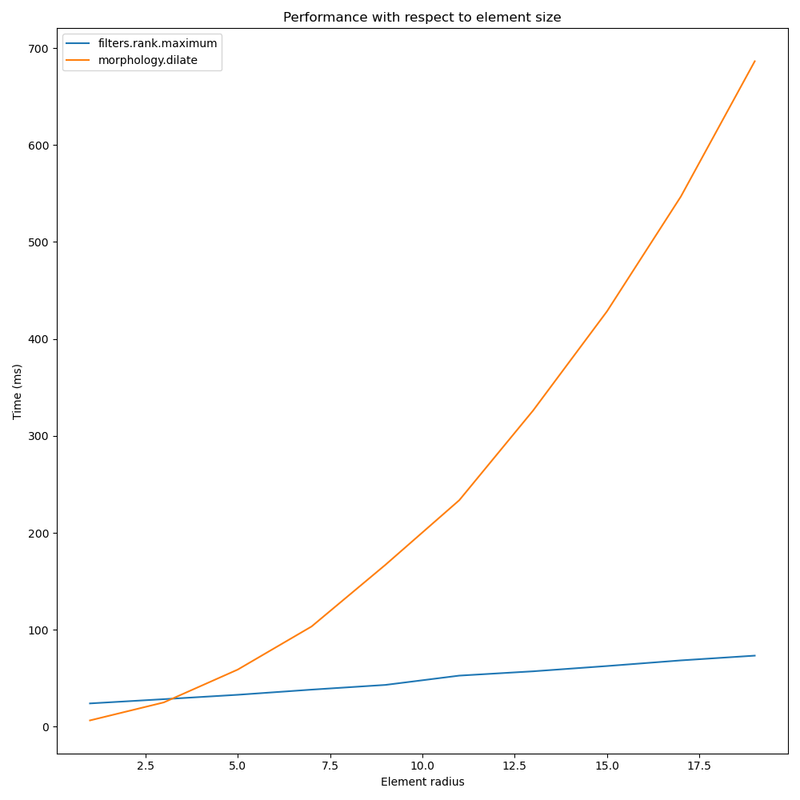 In the following we compare the performance of different implementations available in skimage. """Decorator that returns both function results and execution time."""